For a small ship that carries just 212 passengers, Star Breeze offers a nice range of dining options. In all cases, dining is a relaxed affair. It's all open seating, with plenty of tables for two and four and also for larger groups. There's no extra fee to dine in any venue. Food and service are both generally fine; we were neither overly wowed nor extremely disappointed. 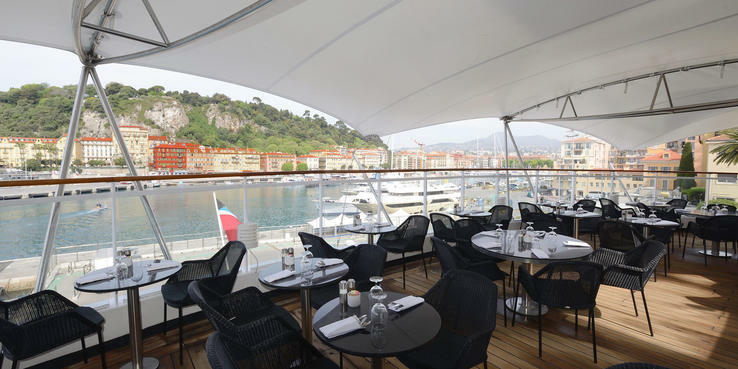 AmphorA (Deck 3): Star Breeze's primary restaurant, AmphorA serves dinner only in an elegant atmosphere from 7 to 9 p.m. (hours might vary slightly depending on itinerary). Each night features four courses -- starters/salads, soups, mains and desserts. Starters might include shrimp cocktail, a caramelized Granny Smith apple salad or cream of forest mushroom soup, while entrees could be surf and turf with Maine lobster and beef tenderloin, Indonesian nasi goreng, braised lamb shank or grilled Atlantic cod. Every night, options include grilled steak, salmon and chicken breast. There are always several vegetarian starters (including a nightly vegetarian soup) and one vegetarian entree, which seems to be pasta about half the time. Look for off-menu chef's specials, featuring either locally sourced items (like fish) or international dishes prepared by the ship's Indian and Filipino restaurant staff. In general, the soups and the fries (both truffle and sweet potato) were exceptional; desserts were disappointing, with an abundance of flavored creme brulees (think peanut butter or Bailey's banana) and bread puddings. Vegetarian dishes were uninspiring, though often the chef could make vegetarian versions of the international dishes upon request, which were quite good. If you have a dietary restriction, the ship can accommodate you, but if you tell the line or chef in advance, staff will go above and beyond to make sure you have options. Service can be slow and dinners lengthy; we averaged two hours. Partly, this is because the chefs cook all food to order, rather than pre-cooking it. Your food will be fresh and hot, but if everyone shows up at AmphorA at the same time, it can lengthen wait times between courses. Veranda (Deck 8): The heart and soul of Star Breeze, at least at mealtime, is Veranda, its casual eatery. Open for breakfast and lunch every day, the buffet restaurant dishes up hot and cold items. At breakfast, this includes fruits (and delicious freshly squeezed orange juice), yogurts, breads, oatmeal, scrambled eggs, potatoes and breakfast meats, along with an omelet station. Passengers can also request hot items, such as French toast or eggs Benedict, made to order from a menu. Bread is a specialty on this ship, and nearly all baked items are made fresh onboard; the croissants -- especially the Nutella chocolate ones -- are delectable. At lunch, the buffet is laden with cold salads, soups, breads, cold meats and cheeses, and hot entrees, such as stews and pastas, as well as a carving station and/or made-to-order pasta. You can order off a small menu if you want grill-prepared burgers, chicken and fish. The grill master makes terrific fries, hot and crispy. Ice cream, which is made onboard, varies daily, as does the array of desserts and fruit. There's limited seating inside the main part of Veranda, but it connects to a spacious outdoor deck overlooking the back of the ship, and it's a popular spot. This indoor/outdoor space also has a host of tables just outside, on the sun deck, that are shaded by a tent. Candles (Deck 8): At night, Veranda morphs into Candles, and its alfresco tables are the most popular spot onboard on evenings when the ship is leaving port late. (It's nice while cruising, too, but can be a bit windy.) The menu is seafood- and steakhouse-influenced, with starters like lobster carpaccio and roasted portobello mushrooms, and entrees like grilled sea bass, veal chops, lamb chops and of course steaks; both filet mignon and New York strip are offered. Vegetarians can choose from a few starters, but the "chef's vegetarian creation of the day" is actually whatever vegetarian dish is on AmphorA's menu that night. Reservations are highly recommended. On some cruises, passengers are limited to just one visit because of popular demand. Deck Barbecue (Deck 7): Another Windstar tradition is its outdoor barbecue, held one evening per voyage on the pool deck. It features delectable dishes such as grilled lobster, suckling pig, jerk chicken and seafood paella, as well as salads, grilled vegetables, fruits (local, if possible) and an array of desserts. The ship's two duos take turns performing. Tables and chairs are set up around the pool area and on the upper deck overlooking the pool (hint: the upper deck is breezier in warm weather), and space is cleared after dinner for line dancing. Yacht Club (Deck 8): For a light nosh, you can find breakfast pastries and yogurt smoothies at the Yacht Club in the morning. In the afternoon, snack on freshly prepared sandwiches, fruit and cookies. Room Service: In-cabin dining is available around the clock. In the morning, there's hot and cold breakfast. During the day and into the evening, passengers can order soups, salads and sandwiches, along with dessert and cheese plates. Late-night snacks include popcorn and chips. During dinner hours, you can also order room service from the AmphorA menu.